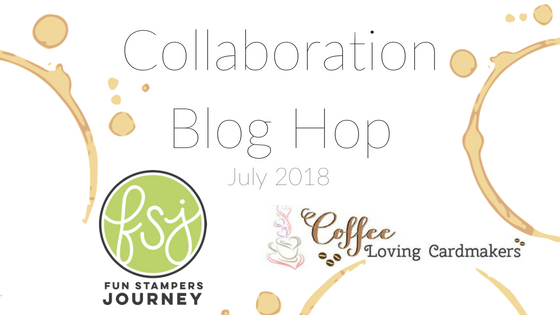 Today, I'm joining along with list of fabulous designers from Fun Stampers Journey AND the Coffee Lovers Cardmaking Blog design team as we collaborate together to bring you a fun blog hop featuring ALL.THINGS.COFFEE! 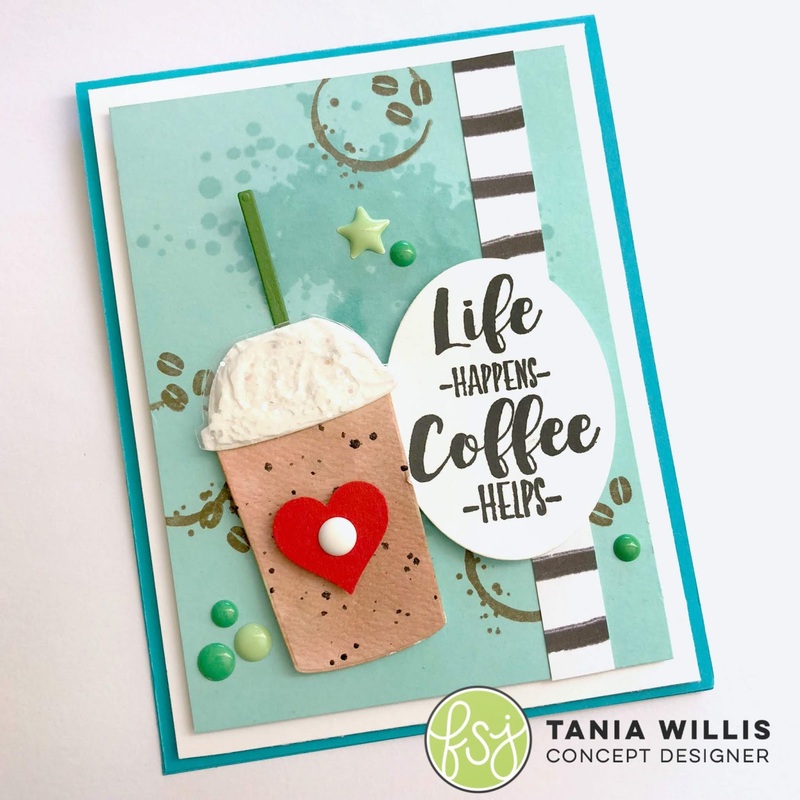 Fun Stampers Journey has the really fun coffee-themed stamp & die products to help you coffee-addicted crafters get your craft on and I've got the inspiration! What's even more fun is that Fun Stampers Journey is offering a $25 Gift Certificate to one winner! In order to be eligible you must visit each blog (the entire list is at the bottom of this post) and comment on each one by 11:55pm PST on Friday July 27, 2018. The winner will be announced on the Fun Stampers Journey Blog. This first card features a really fun stamp set called Coffee Helps that has a really playful set of coffee cup elements and could even be flexible enough to double for your tea-loving friends when used with the "Cup Full of Happiness" sentiment. For my card, I stamped some of the more subtle images from the Coffee Helps set in the background like the coffee beans and the cup stain, added in a sentiment from the Coffee Helps stamp set and embellished it with a handmade embellishment using a stand-alone die-set called Coffee First. I absolutely ADORE the stand-alone die-set because the possibilities are endless! For my handmade embellishment, I die-cut the cup and the domed lid out of Color Splash Sheet which is a watercolor paper and then colored the bottom with our Journey Color Splash pencils. Once it was dry I flicked Black Licorice silk on top to resemble mocha chips. I was going for a mocha chip frappaccino look here. 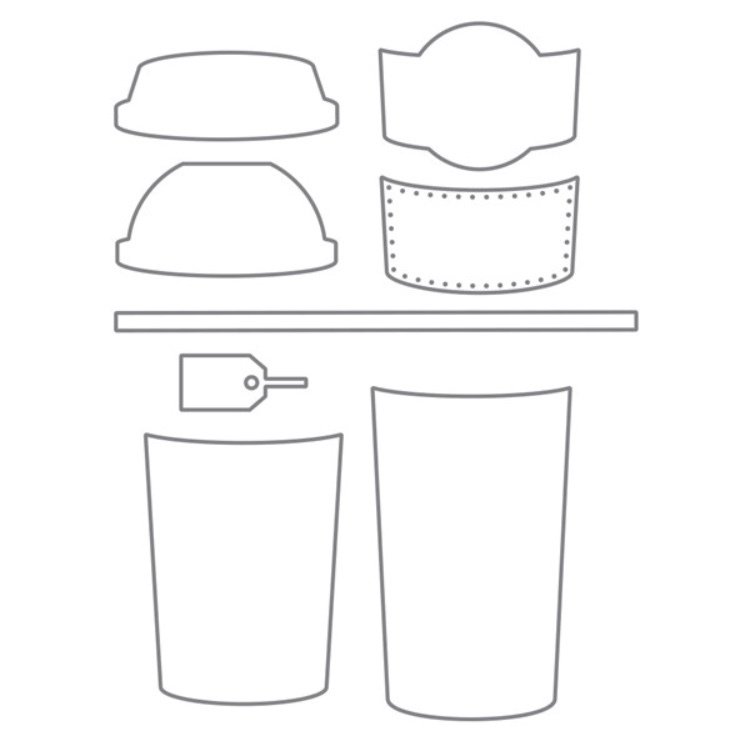 For the domed top, I took the Color Splash sheet and smeared it with Journey Modeling Paste to resemble the whip cream, sprinkled with Journey Sparkle Cuts and then die-cut another domed lid from Clearview Sheet and just stuck it on top. The Clearview Sheet dried onto the Journey Modeling Paste so not adhesive was necessary. It was finished off with straw from the Coffee First die set and a heart punched using the Punch Handle and Love Is Cartridge. Just for fun, I wanted to make up a cute little gift-card holder to share how easy it is to throw together a little giftie for your coffee-loving friends with the the Coffee Helps Stamp & Die bundle. The other die featured here is the Window Pocket Die. I consider this a MUST HAVE. 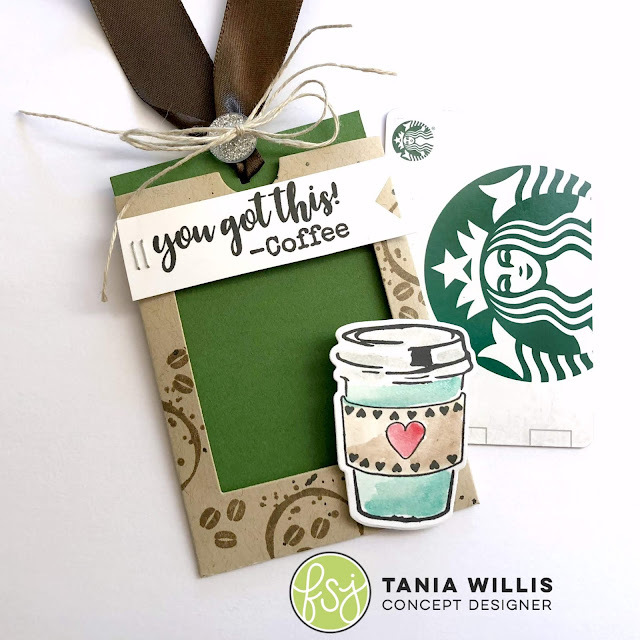 It is my go-to when I need a quick gift for any occasion as it can be dressed up with any stamp set and virtually every gift card looks darling peeking out from the window. This one is very simply embellished with the beans and coffee stains stamped from the Coffee Helps Stamp Set, and embellished with an image and sentiment from that same set. The coffee cup was die cut using the coordinating die which can be purchased with the stamp as a bundle deal for a discount. 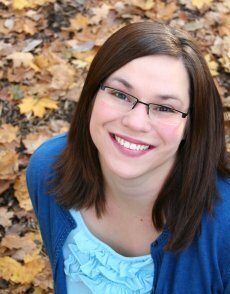 Your next stop along the Blog Hop is to Patricia Roebuck's Blog....HERE. So cute! I love your background! I love your use of colors and your card designs! Fabulous cards. Love how you did your background. And I agree, coffee helps. So deelish! Love your Mocha Chip Frap! The topping makes me just want to lick it LOL. Love the watercolor on your gift card!!! Happy to be hopping along with FSJ today! :) WOO! I love coffee cards so much. this one is adorable! 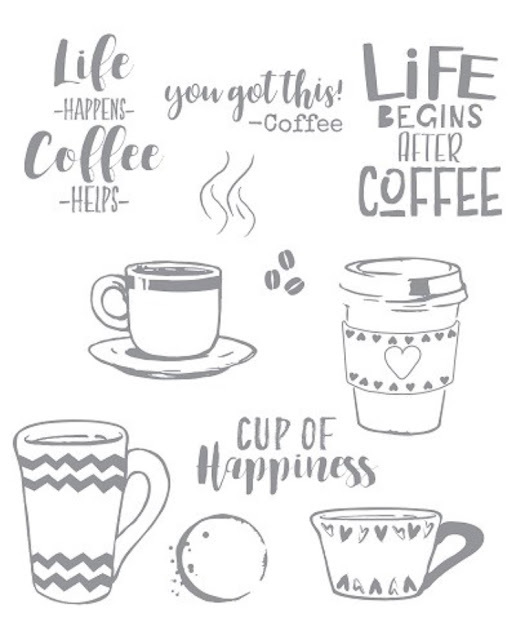 Yes, Coffee does help! I love your projects. 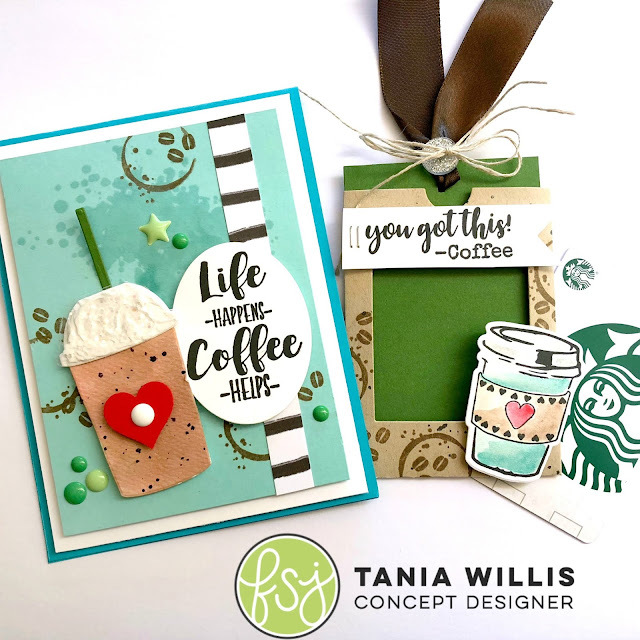 The texture on the frap is so much fun, and the window die just made it to my must have list! Love your inspiring art! Truly adorable cards, and I love love LOVE the idea of another window sheet on top of the paste for the dome lid! Thanks for the awesome ideas with this set, it's one of my favs! Love your card and gift card holder. I am not a coffee person, but know so many people who are. The gift card holder is to die for! Love the card as well, especially the "splat" background, but for sure I'm going to case that gift card holder! Thanks so much for sharing! 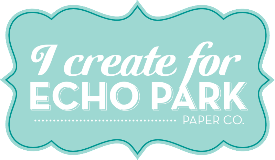 oh my goodness, such CUTE projects! I LOVE them! Love this card and that stamp set!!! I Love this!!! Especially the "whip cream"! The sparkly paste is my favorite part! I love the coffee ring! My mom always has a ring where her cup has been! With all the coffee drinkers in my house, I make a lot of coffee cards. 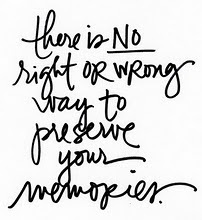 Thanks for more beautiful inspiration! This is my favorite FSJ theme...Coffee! It's my main guilty pleasure. Everyone in my life loves coffee, a more versatile set I have never seen then this! And your designs are stimulating! Super cute projects! Love the gift card holder! I love the background paper choice. Always my favorite. LOVE, LOVE, LOVE the whipped cream on the coffee with the embossing paste!! Such a clever idea! OMG, the whipped cream looks so real and yummy! Beautiful projects. Oh my, your projects are absolutely CUTE!!! Love how you used the modeling paste for whip cream! Great work and great, NOW I SEE NEW STUFF I THINK I NEED! Love that frappucino you created! The whipped cream topping is awesome! And that gift card die... that looks like a must have... awesome projects! Happy to be hopping with you! Your card is perfectly perfectly Gorgeous!!! Love these! Great way to use modeling paste! I love your cards, esp the gift card holder!! Great designs!! Love your color choices on these projects! Hey girl! Love your projects!! Fabulous projects! Great designs and layers. Love your cards. Guess I might have to get that stamp set & die. I love all the extra embellishments like the star gumdrop and the layers! Cool card and gift card holder!! Super cute card! I love the stand alone die set-up many uses. Love!! I love the color combo and the background you created! Beautiful card! Your bonus gift card holder is so cute! What an Amazing Card and gift card! Love what you did on the frapp part of the cup. Clever!! I love your whipped cream, and adding the clear over it is brilliant! The straw is perfect !! Sweet giftie card holder too!! I love your projects and the whipped cream looks so yummy! This stamp and die set is amazing. Love how you made the topping on the coffee. I love your card and the colors you chose! Great projects, love your frappe! Great cards; I really like the sentiments in this set. Thanks for sharing! Cute coffee themed card and gift card holder. How coffee cute is this! I want this in my mail box! �� love all the colors the whip cream on the coffee so adorable! LOVE everything about this card! Your whipped cream is perfect. Great gift card holder too. These are so cute, Tania!! That Frap is adorable!! Love how you did your background, and the gift tags is perfect to give someone a gift card, for what else? Coffee. Love all the dimension in your card! Makes me want a large cup of hot coffee! 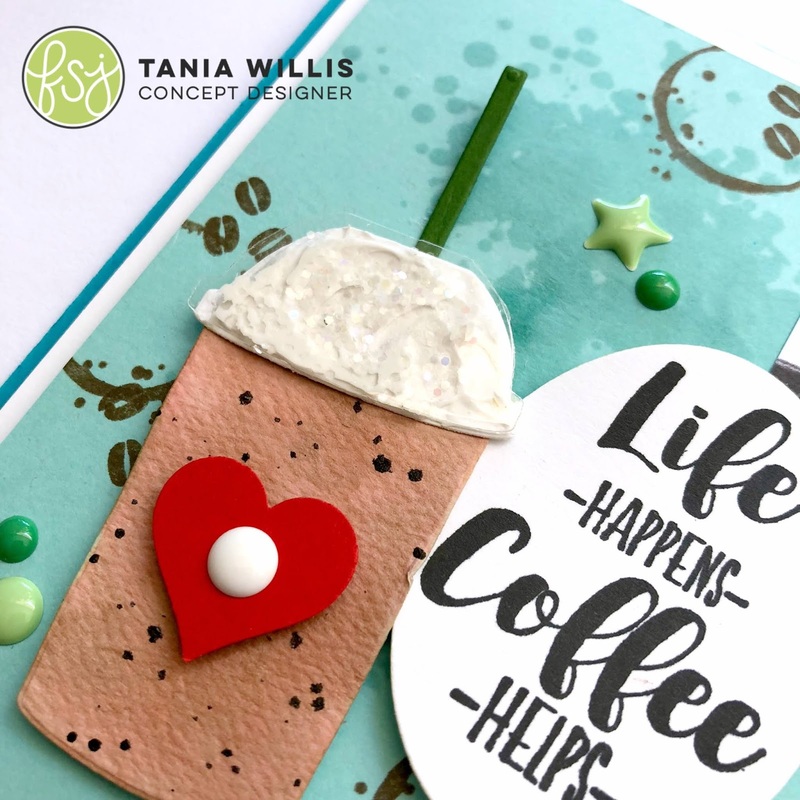 I LOVE these fun coffee cards! They are so fresh and summery and super cute! Tania... I am in love with your coffee cup with cream. It looks so real!!! The gift tag is super fantastic too. This is one of my favorite stamps & die sets. So cute . Love, love, love these! That froth on the first card is amazing! I love how you used the window pocket die. It is simply beautiful and now going on my "must have" list. Thank you for sharing and inspiring. OMG, what fun makes! I especially love the Window Pocket Die!! Love the "foam" in the top of your stand alone cup card!! And the gift card holder is perfect as well!! Nice project. Good background and ckever whipcream and domed cup. Nice idea for gift card. LOVE the "whipped cream"! SO CUTE! I LOVE the 3D version. So cute. Both cards are great. I love all the fun details. Love the cool pool background. Love how you created the coffee drink! Yum! so amzing and so beautiful!! I have this stamp need to create with it. I'm inspired! I love your background. It really adds to the card! Love the gift card holder and the colors. Love both designs; especially the gift card one!